When Do Dogs Become More Calm? Exercising your pooch helps him calm down. Just like you, dogs go through periods of high energy and times when they just need a nap. If your dog never seems to calm down, though, there may be something you can do to help. Other times, all you can do is be patient. Dogs need exercise or they won't calm down. Imagine if you never did anything except lie around the house, eat and look at squirrels out the window. Lame, right? And you would get a little stir crazy. When you exercise your dog, you help him work out all that pent-up energy, which makes it easier for him to calm down and relax. If your dog is always bounding around the house, don't try to stop him from playing -- just redirect it. There's one simple, common procedure that is almost guaranteed to calm down your dog, and it goes "snip, snip." Getting your dog neutered is a sure way to help him calm down, as he won't be motivated by hormones and the desire to procreate. He won't care that you did it, either, so you don't have to feel bad. Spaying works almost as well on lady dogs, too, so get your furry friend fixed and she'll calm right down. Your dog may have trouble calming down because you give him too much freedom. Like strict schoolmarms, dogs have kind of a thing for rules, consistency, order and rapping children on the knuckles with rulers. 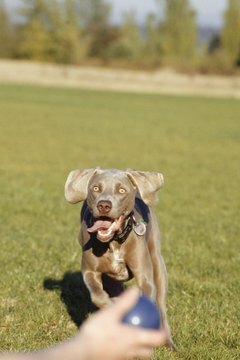 If you don't impose any order on your dog, he's going to run wild -- literally. Training your dog to follow commands, as well as governing his expectations and maintaining a strict schedule, keeps his mood and energy levels in check. Kind of like kids and adult humans, puppies have lots of energy. That youthful vigor may make it seem like your pup never calms down, but the truth is, he just has extra energy in his system. As he physically matures, grows older, puts on weight and stops growing, he'll also calm down. That may mean that you're stuck playing the waiting game while he sows his wild oats, so you may as well cherish the experience of watching him grow. What Do Dogs Sniff for at Potty Time? Do Cats Like Being Picked Up by the Nape? Does Neutering Yorkies Calm Them Down?